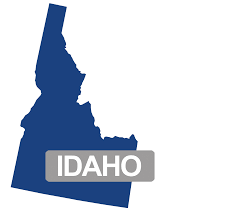 Idaho has proposed a Tiered Licensure rule that potentially ties a teacher’s license to student test scores and local evaluations. To bribe teachers to accept this bad idea, an ‘increased’ teacher salary would also be tied to these evaluations. Tiered licensure is bad for kids, taxpayers, and teachers. PLEASE SIGN OUR PETITION IN OPPOSITION TO THIS BAD POLICY! Below is a quick synopsis of reasons why this is poor legislation, along with resources to better educate yourself and distribute to others. This entry was posted in Tiered Certification and tagged Board of Education, Common Core, evaluation, ISAT, SBAC, special education, Test Scores, value added model on September 28, 2014 by Levi B Cavener. 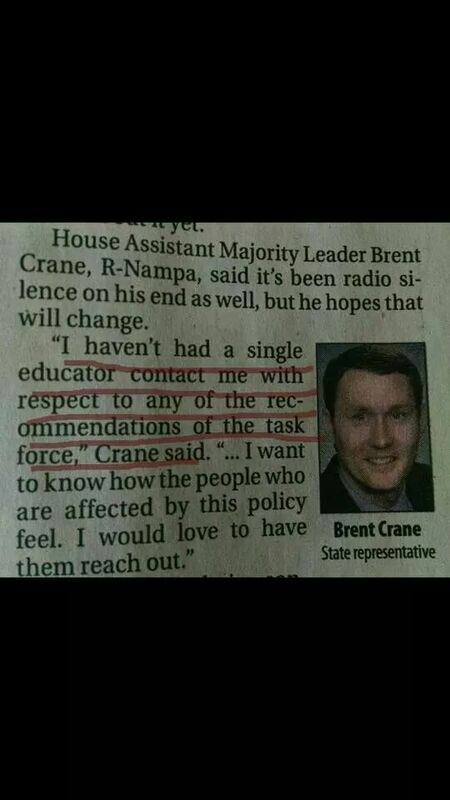 Rep. Crane: Idaho teachers haven’t talked to me regarding tiered licensure…except we have. Here’s the proof. This entry was posted in Tiered Certification and tagged Rep. Crane, value added model on September 20, 2014 by Levi B Cavener. This Saturday the host of The Great Education Struggle blog and podcast , Isaac Moffet, was gracious enough to open up his studio for an interview on how Common Core is impacting special education students. It was a pleasure to take part in describing the impacts I see of Common Core and related policy in my own classroom. Also of note, Travis Manning, a candidate for District 10A in Idaho’s legislature and Director for the Common Sense Democracy Foundation of Idaho, was kind enough to join us to share impacts he sees of Common Core in the general education classroom, particularly for special education students who have been mainstreamed into his environment. The interview covered lots of juicy topics including common core, the SBAC, tiered certification, and the influence of politics in Idaho’s educational system. This entry was posted in High Stakes Testing, Special Education, Tiered Certification, Value Added Model and tagged Common Core, SBAC, special education, value added model on September 15, 2014 by Levi B Cavener. 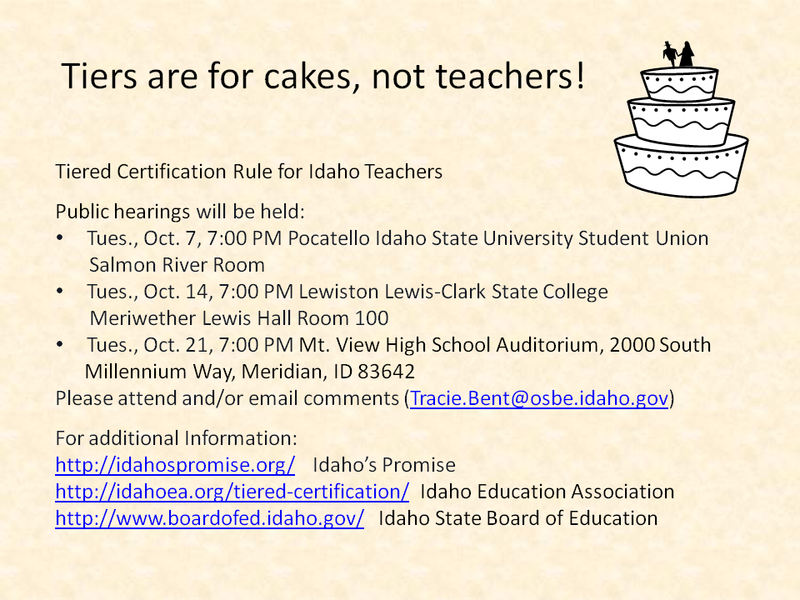 The Board of Education recently sent out an open letter to Idaho’s educators regarding the new Tiered Teacher Certification proposal. The letter flatly admits that Idaho’s teachers aren’t compensated anywhere near where they should be (true), but then argues that the only way Idaho legislators would find a raise to be palatable is to move to a tiered teacher certification system (false). A few things to point out here: a tiered certification system is a completely separate topic than teacher compensation. The attempt to conflate the two different items as being one and the same is deceptive, at worst, and misleading, at best. This entry was posted in Special Education, Tiered Certification, Value Added Model and tagged Board of Education, Common Core, SBAC, value added model on September 14, 2014 by Levi B Cavener. Value Added Model (VAM) and Proposed Tiered Licensure: Are SpEd Students and Their Teachers Valued? That’s what the proposed rule change requires for an educator to move from a residency certificate to a professional certificate, or for an educator to maintain a professional certificate and not be stripped of that certification and be placed on a quasi-probationary contingent certificate. This entry was posted in High Stakes Testing, Tiered Certification, Value Added Model and tagged Common Core, SBAC, special education, Tiered Licensure, value added model on August 17, 2014 by Levi B Cavener.